To lead our Morning Service, we welcomed Methodist Local Preacher, Phil Bingham, from Wivenhoe. 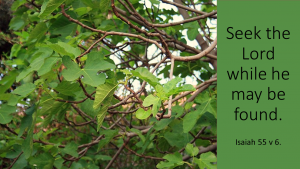 Phil spoke to us about Fig Trees, Greengages and Isaiah’s message which encourages us to “Seek the Lord while he may be found” (Isaiah 55 v 6). His sermon can be heard here. Order of Service for 24th March 2019. Lent Liturgy : Money Bag. Singing The Faith No. 544 “As the deer pants for the water”. Prayer of Approach and Confession. Children’s Talk: Doing the Right thing. Singing The Faith No. 249 “Jesu, Jesu”. Reading: Isaiah chapter 55 verses 1 to 9. Reading: 1 Corinthians chapter 10 verses 1 to 13. Reading: Luke chapter 13 verses 1 to 9. Singing The Faith No. 663 “I the Lord of sea and sky”. SERMON: Seek the Lord, while he may be found. Isaiah 55 v 6. Singing The Faith No. 556 “Just as I am”. Prayers of Thanksgiving and Intercession. Singing The Faith No. 248 “I heard the voice of Jesus say”. Postlude: Little Prelude No 1 by J S Bach.